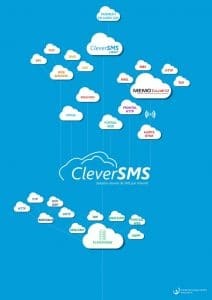 CLEVERSMS is a sending and reception SMS solution, vocalized messages, fax and e-mails since any type of computer, towards any telephone, mobile or land-line. The CLEVERSMS solution is available in « fullweb » mode (ASP). It is available internationally, as long as you get an Internet connexion and access codes, you can safely reach your usual database, your sending logs and statistics. This system can also be installed locally, as a network or standalone mode. The system manages a database which enables to store the recipients’ data. This common base will be accessible in real time by as many users as you wish, provided that they have the system access codes. – Multiple mailing lists management. – Messages preparation in advance, by planning their sending in a differed way (one year). – Messages follow-up (anomalies handed over to the operator, delivered on the recipient’s GSM). – Follow-up and Consultation of sending logs and statistics exportable on Excel. – Mobiles mailing toward all types Bouygues, Orange, SFR. – Landlines telephone mailing known as “vocalized” messages. – International mailing, (more than 184 operators open in the world). – Mailing from your Web interface. – Direct mailing from your electronic mail service. – Completely protected mailing, access via a login and a single user modifiable password. – Preparation in advance and messages possible automation. – Message automated personalization (gender, name, first name, company). – Mailing lists setting, unlimited, data base import/export. – Punctual mailing or in a simple or multicriteria way, recipient’s simplified management. – Punctual or many mailing, recipient’s simplified management. – Available for consultation on the Web interface, constantly and from anywhere, with your password. – The reception on the mobile is indicated to the software application and leads to the cessation of mailing attempts. – For messages intended to landline telephones, the message is automatically vocalized. – In flash mode, the messages are directly displayed without tedious handling. – Messages are sent in less than 3 seconds. – The platform availability is maximum, its rate over 2008 was: 99, 9% (24 h/24). inondations : Les chateaux en danger !